I took advantage of the 11/11 discounts from Aliexpress to get a mobile USB battery pack. I knew the quality will be realtive, so I went for the so-called 20.000mAh model. When it arrived, I decided to make some tests on it. For all tests I used the included USB A-microUSB B cable, which seems capable of providing the advertised 2.1A, but has the data wires disconnected, presumably in order to comply with the Chinese standard for mobile phone chargers. What 20,000mAh means is that, in theory, the 3.7V Lithium battery could provide a 1A CC current for 20 hours. This means the battery can hold 3.7V*20Ah=74Wh. However, the USB standard requires 5V CC, so the user will only have 74Wh/5V=14,800mAh available. Furthermore, the technical details on the back of the battery (Fig. 2) state the capacity is only 48Wh, which means 9,600mAh, or less than half of the advertised capacity for actually loading some devices. 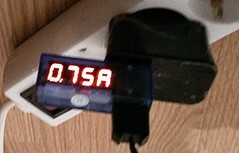 For charging the battery I used a 1A charger, since this is the maximum current accepted by the battery. It took about 12h to load, with the current going down from 750mA to 400mA (Fig. 3). It is only a guesstimate, since I don’t have the exact current curve, but I suspect it can’t have loaded more than 5V*600mA*12h = 36Wh, or 3/4 of the advertised capacity. The problems started to pile up when trying to use that energy to actually load some devices. I used a Nexus 4 (2100mAh battery) and a OnePlus One (3100mAh) battery. I started charging when the phones had about 20% from the battery left. It quickly became obvious that I could not leave the phones unsupervised: the battery would get hot really quick (surface temparature above 50°C) and the loading would stop until I restarted the battery. I guess I should be happy that there was a protection circuit, otherwise the loading circuit could become a fire hazard. The problem would become more and more serious as the phones’ batteries charge, so I could not get a definitive loading time for the OPO. All I can say it got from 20% to 83% in 2h10′. This means ~2000mAh in 2.25 hours, or more than a quarter of the presumed capacity of the battery. With the Nexus 4 things went more smoothly: after leaving the battery to chill for a while, I was capable to load the phone 3 times with one charge of the battery, with some energy left in the battery. This would mean a capacity of at least 80%*2100mAh*3=5040mAh. Another problem was the serios variation of both voltage and current during loading. It was at least 4 times as large as the one observed with a quality charger (see the movie at the end of the article). I don’t think most modern electronic devices would have any problems with that, but some older devices might encounter issues. In conclusion, I think we can say I have a battery with a capacity of about 5-6000mAh, which gets really hot pretty fast. It can be a life saver, but it’s not a product one can depend on. I will probably go for a Xiaomi or Anker external battery next – I’ve seen some really good reviews on the Internet about them. For the curious, I have added some additional pictures at the end of the article, with the associated explanations. Fig. 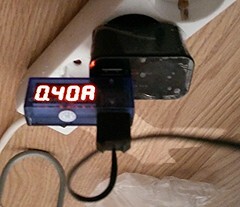 4: With no load, the Lithium battery voltage of 3.7V is visible. Fig. 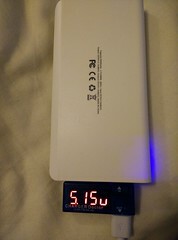 5: Under load, the maximum voltage is about 5.15V.